IMPORTANT UPDATE 11AM Fri: UKMET extended AMBER warning to include all of SE inland including Reigate, Surrey, London: gusts of 60mph possible overnight. Latest update: (pm Thurs): one HiRes model just HALVED rainfall totals for storm tomorrow: if others follow that’ll be good news for flooding. This storm is not resolved perfectly yet, some models flip and flop before the event. Nevertheless, one to watch for signs that, perhaps, the rain is being over-done. In fact, rainfall totals have rarely matched model runs in recent events… fast moving fronts have simply zipped by so fast that rain totals have been rather low. example: 8.8mm on 12 Feb front yesterday. Now you see it…?! Rain totals just halved on latest HiRes model run (left). GOOD NEWS for floods! Update for Reigate and SE England on UKstorm Fri 14 – Sat 15 Feb: the storm tomorrow is yet another serious weather event, this time focusing most intensely on SW, Southern coasts and SE England and Wales overnight Fri-Sat. Below are some satellite pictures from today showing the rapidly intensifying storm in the Atlantic to the SW of the UK. The wind and rain forecast on NWP models for inland SE areas are severe: often the forecast winds and rain do not transpire, coming in at a good deal less than the modeled projections especially for sheltered towns where most people live. However, the magnitude of figures consistently being predicted for gusts and total rain associated with this storm in our area are consistent enough to be of some concern, especially for places exposed to southerly winds (on hills like North Downs, for example) and at risk of flooding, either surface water flooding or in the flood plain for the River Mole or tributaries. Rainfall will be heavy throughout Friday and could total over 20-30mm in 24 hours in places. If this exceptional rainfall does occur then extensive local flooding is likely to result rapidly, especially along the River Mole catchment which has a flashy response to rain within 10hours. Winds are due to possibly exceed those experienced this winter so far, forecast to peak at over 60mph gusts inland early Sat am. Heavy rain is also likely to add to the problems of flooding. UKMO warnings stand at Yellow alerts for Reigate and Surrey from Fri through to Sat 15 Feb and AMBER alerts for all places nearer the coast. The storm is rapidly intensifying and will bring heavy rain all day to Reigate and Surrey and the SE as a whole through Friday, totals could be over 30mm, which will cause the River Mole to flood in places and plenty of surface water on the roads. Strong winds build gradually through the day and will peak overnight in the small hours of Saturday morning. The winds, even inland, could even gust at 60-70mph and for southern coasts 75-80mph. These are exceptionally strong gales for inland and, if these NWP modeled magnitudes transpire, it would be exceptionally bad news for the region already suffering from flooding. Remember our strongest gust for YEARS in Reigate was 52mph in January. So any wind speeds over 60 mph will be exceptional. 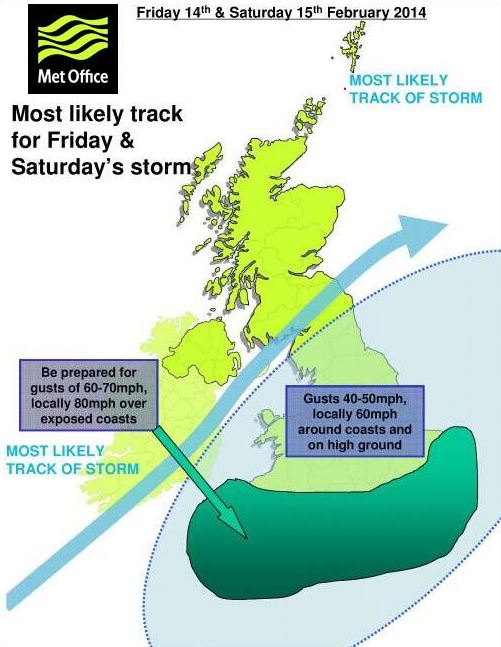 The UKMO also forecast wind gusts over 60mph around midnight. ESTOFEX have issued a Level 1 tornado warning and for isolated gusts from afternoon onwards due to warm air advection and presence of sub-tropical air wrapped in the system. This will add lift and energy to frontal rain bands which might cause thunderstorm activity, the odd clap of thunder embedded in fronts might be a sign of tornadic potential activity so keep an eye our for funnel clouds or drops in cloud base or tornados. If you see any of this please tweet or email a picture! The saving grace is that it passes over relatively quickly and winds will abate on Saturday leaving a bright possibly showery and blustery day. The remainder of half term week looks less dramatic and with a ridge of high pressure flirting with the South it should be more settled, albeit with another LOW early in the week, but this is much less intense. RGS weather is on holiday for the remaining week, inspecting the other side of the jetstream in the Atlas Mountains of Morocco. Intending to fly out from LGW at 4am on Sat morning! Close up and personal with this storm but sadly no tweet updates are likely. By the way, press details can be hopelessly inaccurate, especially certain papers! 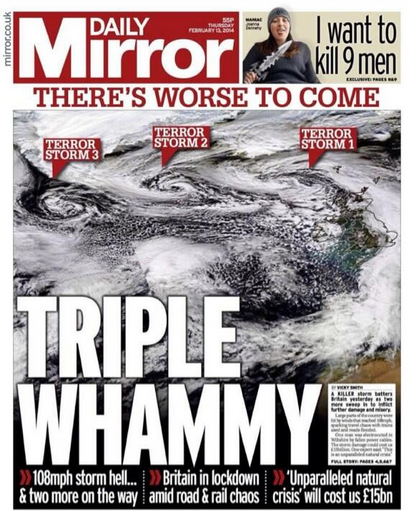 The pic below is wrong: indicating several storms that were not a special problem for the UK… handle with care!